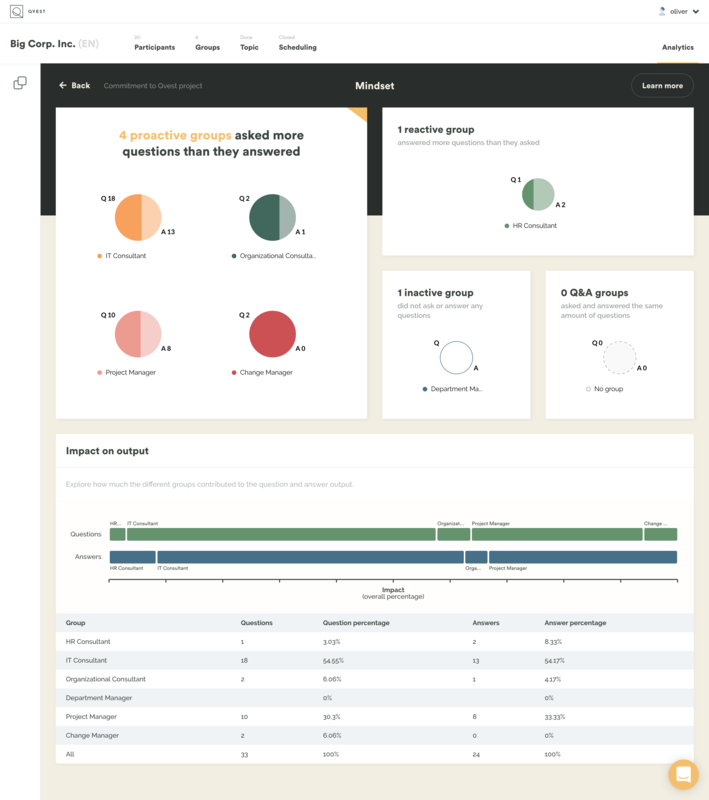 The Activity feature displays how much your different stakeholder groups contributed to the Qvest. Activity is considered high when more than 60% of your stakeholders either asked or answered a question. Similarly, activity is considered good when 30-59% of your stakeholders asked or answered a question, and low when less than 30% of your stakeholders asked or answered a question. Depending on the total activity in your Qvest, you will get a message in the top box saying that you should either be happy (because you have a lot of valid data), or be aware (because your findings won't be equally relevant or applicable to all your groups), or be careful (because low activity means inconclusive data). The two small boxes to the right show the groups with the highest and lowest activity level respectively. 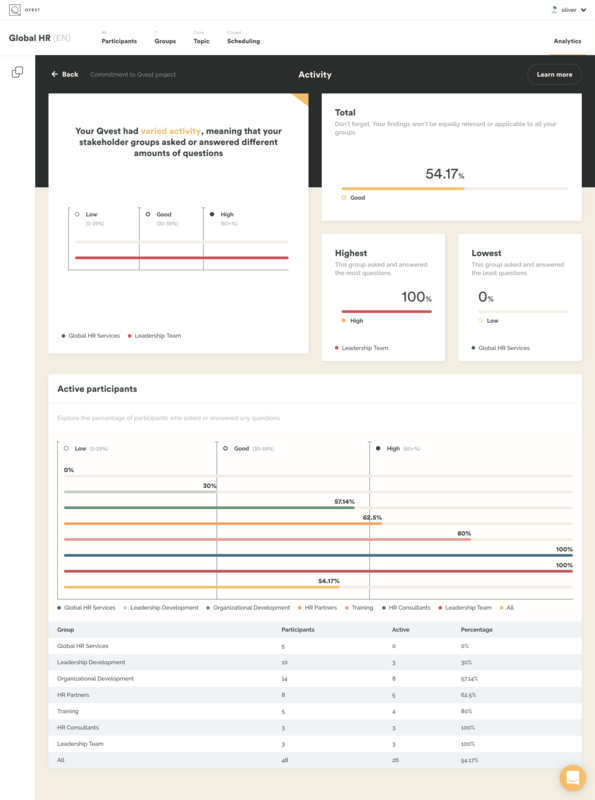 Below the Activity findings, you can explore the percentage of stakeholders who asked or answered any questions in each group. 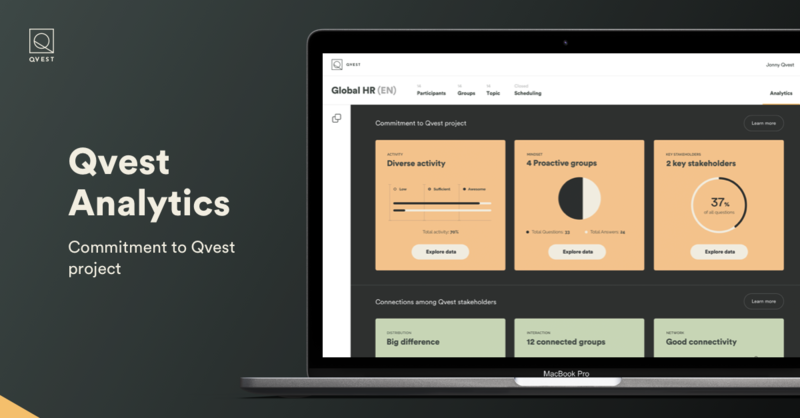 In the Mindset feature, you can see whether your different stakeholder groups were inactive, reactive or proactive in relation to the Qvest project. A group is considered proactive when the stakeholders ask more questions than they answer. Similarly, a group is considered reactive when the stakeholders answer more questions than they ask, and active when they ask and answer the same amount of questions. When the stakeholders in a group neither ask nor answer any questions, the group is considered inactive. Below the Mindset findings, you can explore how much the different groups contributed to the question and answer output. 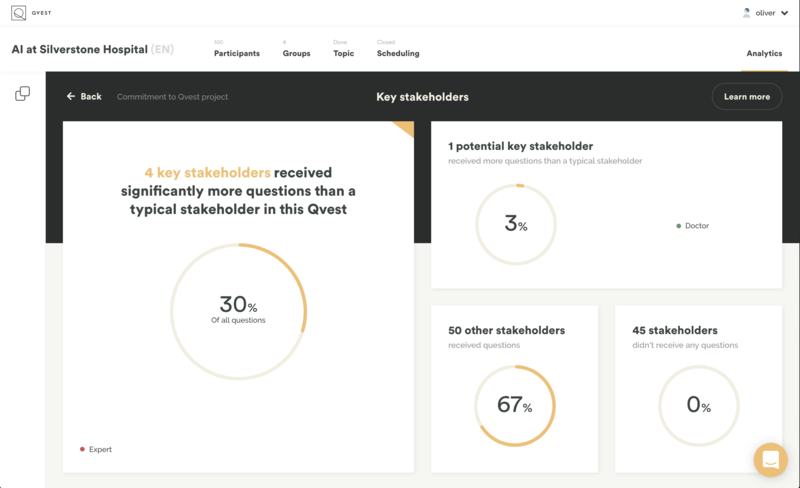 The Key stakeholder feature tells you in which groups your key stakeholders (and potential project ambassadors) are located. A stakeholder is considered a key stakeholder when he or she deviates significantly from the remaining stakeholders. The deviation is measured in the number of received questions. Similarly, a stakeholder is considered a potential key stakeholder when he or she is showing signs of deviation in the number of received questions.